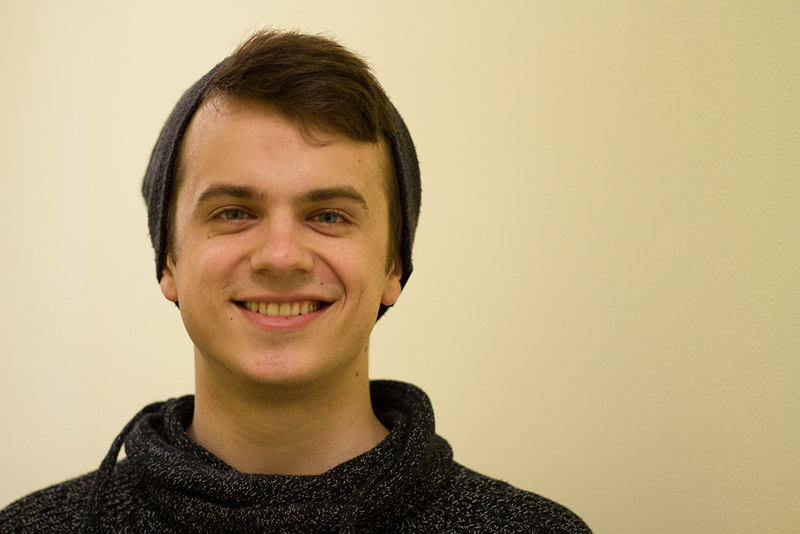 John Depa handled SGA’s funds as Executive Treasurer for two years. A student came into the Student Life office last year, apparently frustrated that John Depa had not answered her email in a timely fashion. Andrew Donahue, the office’s assistant director, remembers informing her that Depa was not in the office because he was in class, and the student seemed surprised. She assumed Depa worked there full-time. Depa, 22, is the Student Government Association executive treasurer, but he’ll graduate this spring with a visual and media arts degree. He has worked for the past two years to allocate the Student Activities fee fund—$190 per full-time undergraduate, more than $500,000 total—among student organizations, and then work with student leaders to make the most of their budget. He’s spent much of his time as executive treasurer restructuring the role to alleviate some of the position’s responsibility. “I have to spend the money that 3,700 undergraduates have handed me to spend responsibly,” Depa said. Depa first interacted with SGA as a sophomore, working with his predecessor to get his new organization, Anime @ Emerson, SGA recognized. He was already good friends with SGA Executive President Emily Solomon, and they began talking about the possibilities for fixing the role. By spring 2015, Depa was running unopposed for the position. Depa’s goals were to change how the treasurer communicated with student organizations. As an organization leader, he had been frustrated by confusing channels of communication and slow replies—issues he later campaigned on. But as he felt out the role last year, he realized the main problem was the unlimited reach and responsibility the treasurer had. The workload was too much, especially on top of his classes and full-time job. Over the past two years, Depa, on average, spent 15 to 20 hours a week working as treasurer. On Wednesdays and Fridays, he spends time in the Student Life office processing paperwork turned in by student organizations that need to buy supplies, setting up contracts, or reimbursing members. But even when he’s not physically present, he’s on his phone communicating with organization leaders and Student Life staff to ensure things are running smoothly. Earlier this semester, Depa’s treasurer inbox filled with over 400 emails in the course of two weeks. This year, Depa focused on restructuring the position to hopefully alleviate that pressure for the incoming treasurer. Since Depa communicated so often with student leaders about their organizations’ finances, he found that he was the most accessible person to answer these students’ other questions. He often fielded emails about topics not under his purview, like booking rooms on SpaceBook or planning trips. He helped develop a new organization reactivation process, which requires student leaders to attend workshops with full-time Student Life employees, including Donahue. Though Depa still ran a treasury workshop, leaders were also learning about leadership development and college policies from Donahue and Jason Meier, student activities director. “Having Student Life more present at training makes it so that student leaders can see, clearly, the difference between their student representative and the full-time support staff,” Donahue said. He also opened up a treasury hotline, which students can text or call with urgent financial questions that can get lost in his email inbox. All messages and voicemails are forwarded to the treasurer and vice treasurer. He’s also been researching ways to republish the paperwork that comes with his position on a digital platform. Nicholas Novak, president of the National Broadcasting Society, went through the SGA appeals process last semester to get a camera for his organization. He said Depa has always been a reliable contact. “He’s always willing to sit down with you one-on-one,” Novak said. Depa had concerns about the lack of checks and balances in the position—he could essentially make any changes to the Treasurer’s Handbook he wanted, which sets the rules for how the position operates. This semester, he made the Financial Advisory Board—a group of SGA members, student representatives, and the SGA advisor, who previously met annually to make decisions on Student Activities budget allocations—a permanent fixture of SGA. The board will be responsible for approving changes made to the handbook, as well as approving budget appeals student organization leaders formerly made at SGA joint session meetings. All FAB decisions will still be approved by joint session. Ian Mandt, who will take over Depa’s position next semester, served as executive vice treasurer for three semesters under Depa. Mandt said the changes will make his job easier this fall. Sharon Duffy, assistant vice president for student affairs and SGA advisor, said it’s best practice for a student to control the student fee, but that she sees how much of a responsibility the position is. “It’s good to see him set limits,” Duffy said. Depa said that certain aspects of the role are decisions that should be left to a student. He’d like to see the role more focused on those, and the rest of the responsibilities moved to full-time staff.